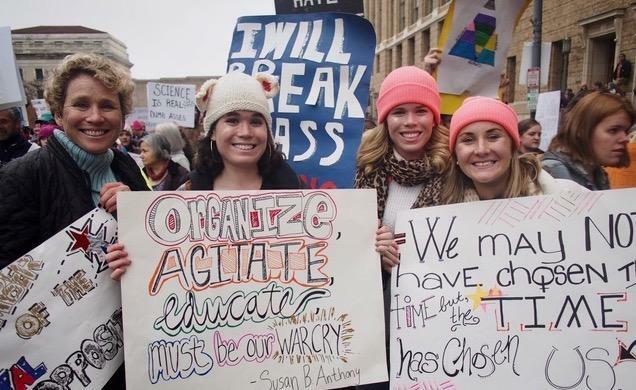 District 6 congressional candidate Chrissy Houlahan attends the 2017 Women's March with daughters Molly and Carly, and friend Meredith Cheney. 90.5 WESA's Adelina Lancianese reports that more women than ever are running for the U.S. House. The names of distinguished men who have represented Pennsylvania in the U.S. House of Representatives could fill a book. But names of the women who have done the same fit comfortably on a sticky note. The Associated Press reported last week that a record number of women nationwide have filed to run for the U.S. House—309 across the country. That surpasses 2012’s record of 298 women. And many Pennsylvania women are among them. More than three times as many women filed for candidacy in the state this year than in the last House primary races in 2016. In this year’s Pennsylvania primaries, according to political database Ballotpedia, 24 women have filed to run for the U.S. House. That’s a fourth of 93 total primary candidates across 18 recently-redrawn districts. Three women, however, have since withdrawn. 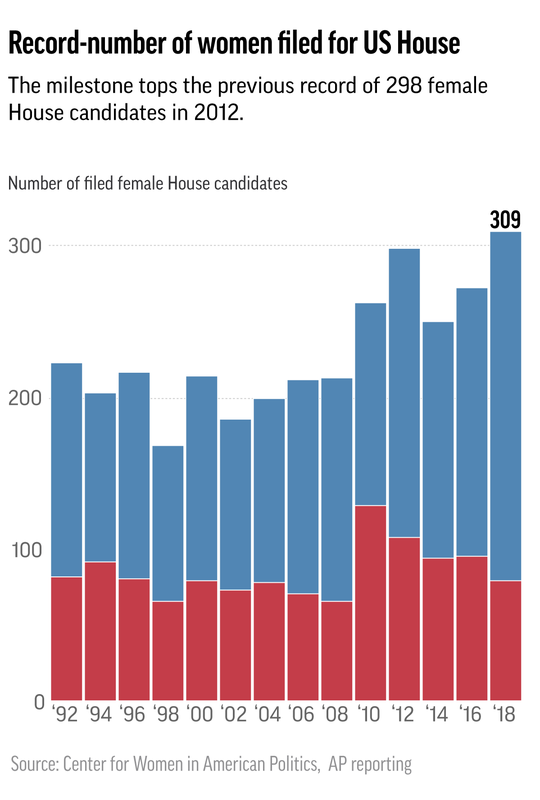 More women than ever filed to run for the U.S. House of Representatives this year. Data show the trend is strongest among Democrats. According to the AP, Democrats make up two-thirds of female candidates running to represent the U.S. House, as are 22 of the 24 women who have filed for Pennsylvania races. 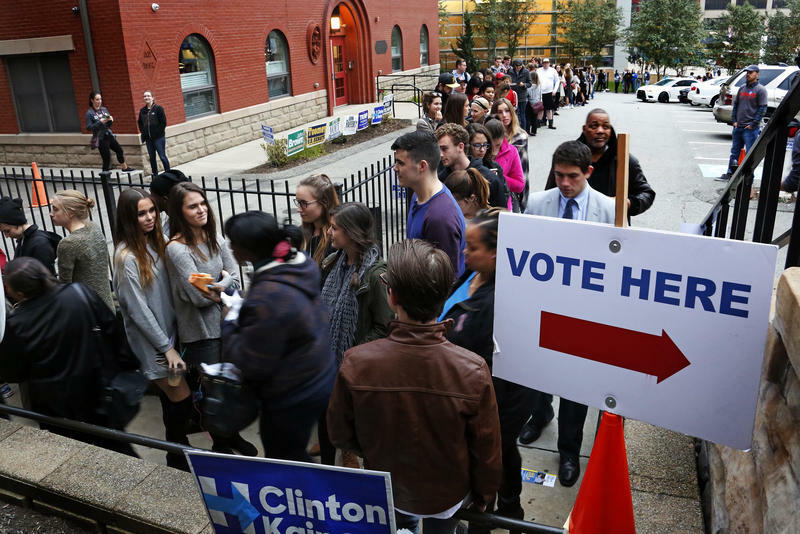 “It’s a trend we’ve been seeing since the 2016 presidential election,” said Jennie Sweet-Cushman, assistant director at Chatham University's Pennsylvania Center for Women and Politics. Women Democrats are energized by the momentum of movements across the country, including the 2017 Women’s March and the #MeToo movement, according to the AP. And many of them are embittered by the election of President Donald Trump, who has remained center in a tumultuous undercurrent of alleged misogyny and sexual assault throughout his candidacy and presidency. The engineer: "I feel pretty darn-well prepared." Chrissy Houlahan is one of those women, inspired by recent political events to run for office for the first time. In Chester and Berks counties' District 6, Houlahan is the sole female candidate, which is also true in the majority of Pennsylvania’s districts. She is running unopposed in the Democratic primary, and she’ll ultimately face Republican Greg McCauley in the general election. But Houlahan is used to entering and dominating spaces traditionally occupied by men. She became an engineer in the 1980s, when less than 6 percent of engineers were women. Then she joined the U.S. Air Force, which today is roughly 20 percent female. And she said she also helped run a basketball apparel business that largely employed and catered to men. Air Force engineer Chrissy Houlahan is running for office for the first time, in Pennsylvania's 6th district. Houlahan points out that Congress is also disproportionally male. There are 83 women in the House, or 20 percent of all members. And Pennsylvania’s current delegation are all men. Houlahan said she never really noticed those things until she decided to run. “Part of my thought process was influenced and impacted by the Women’s March. I helped to organize a busload of women from my community who went down to the Women’s March in Washington, D.C.,” she remembered. EMILY’s List, a prominent political action committee that encourages women to run for office, endorsed Houlahan early in her campaign. She also took part in a local Ready To Run training event, which teaches women the tools to run successful campaigns. Houlahan said she believes that voters welcome the change she knows she’ll bring as a woman. “I’m hopeful that there will be a pretty big change in 2018. I know that I’m not the only woman running in our state right now, not only in Congress, and I think this is the beginning of a larger change,” Houlahan said. Where were all the women? "I’ve always preferred the background." 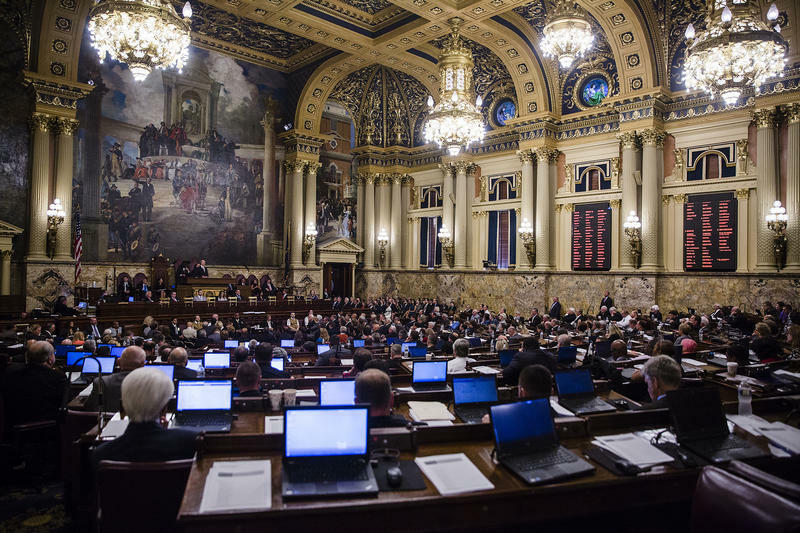 Just one woman elected to Pennsylvania’s House delegation would be a marked shift in a largely homogeneous history of all-male delegations. According Ballotpedia, 1,086 people have represented the state in the U.S. House of Representatives. Only seven have been women, and three of those were specially elected to fill vacant seats left when their husbands died. 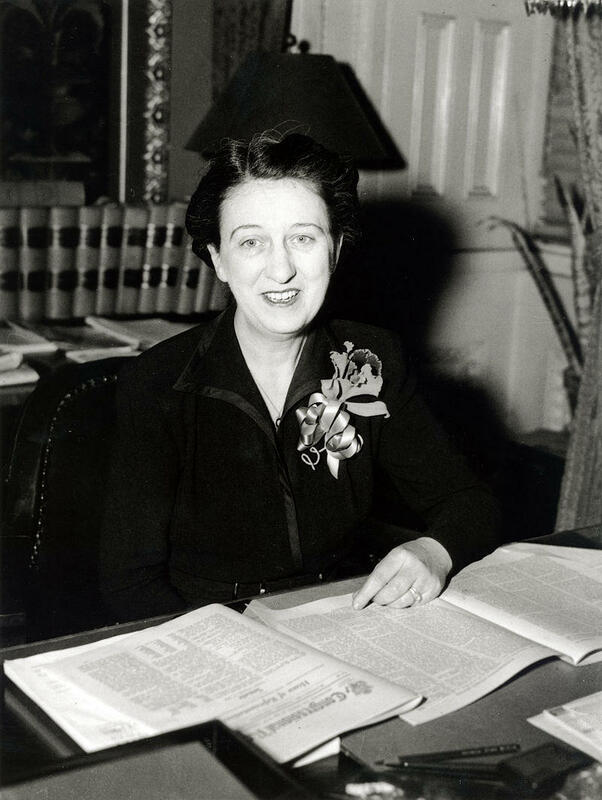 Veronica Grace Boland was Pennsylvania's first congresswoman. She ran for the seat that her deceased husband left vacant, and she served for only a month. The Pennsylvania Democratic Committee had asked Boland to fill the seat of her husband, Patrick Boland, when he died at the end of his sixth term. She served for less than a month before Congress adjourned and did not seek reelection. It wasn’t until 1993 that a Pennsylvania woman was elected to the U.S. House without first taking the place of her husband. The commonwealth has never elected a female U.S. senator or a female governor. “When you have a state that is a majority of women—over 51 percent—and virtually none of [those women]... have been represented by women, what does that say about us as a democracy?” asks Sweet-Cushman. Better Medicare Alliance CEO Allyson Schwartz was the last congresswoman to have served on behalf of Pennsylvania. She said she learned how to navigate politics as one of the only women in the Pennsylvania Senate. But throughout her time in Congress from 2005 to 2015, she noticed women had to work together to work within a system that favored men. Hillary Clinton might call that a glass ceiling. Sweet-Cushman called it a double-bind. “We have different expectations for women than we do for men. There’s research that shows we will vote for a man that we don’t like as long as we agree with him on policy issues, but we have to like the woman [to vote for her],” she said. Pennsylvania's primary takes place Tuesday, May 15. The general election follows on Tuesday, Nov. 6. Schwartz said that women had to speak up and pick their battles to be successful in Congress, and that they relied on each other for support. Women with tenure would mentor new members, who passed that tradition down as they rose in the ranks. 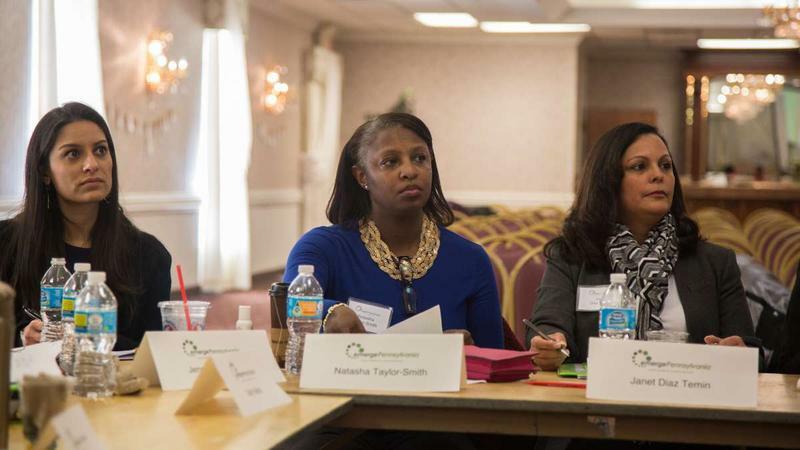 But there’s little institutional support in Pennsylvania to push women into the pipeline, according to Schwartz and Sweet-Cushman, from concerned citizen to local office, and then to representing the state nationally. The businesswoman: "Able to get the job done." 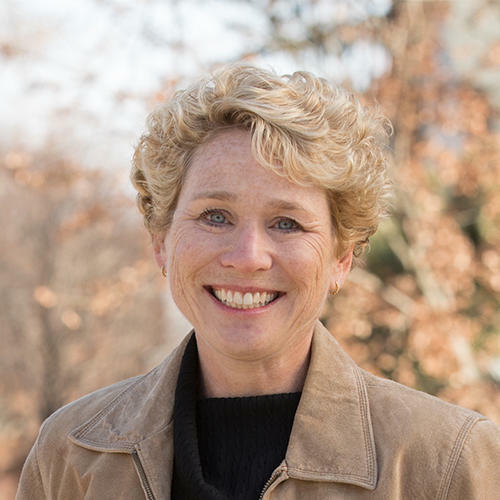 Boerio has spent her career campaigning, first by promoting the automobile industry as a chief financial officer for Ford Motor Credit Company and a managing director of marketing and sales for Jaguar Cars, and then maneuvering the U.S. House as chief of staff to Congressman Joe Sestak. 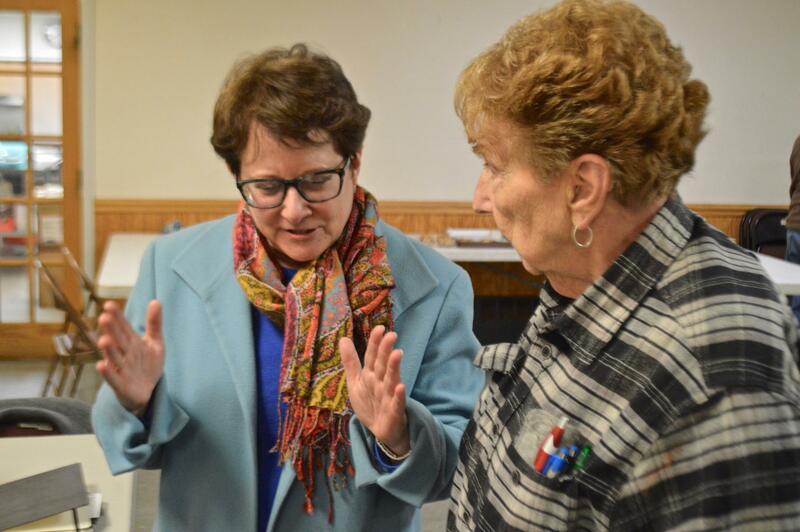 Congressional candidate in the 14th district Bibiana Boerio (left) speaks Madeliene Manning, a longtime Democratic Committee woman in North Huntingdon. Now, Boerio is one of three women in both parties—including Democrat Beth Tarasi, who has since withdrawn her candidacy, and Republican Janis Brooks—who initially filed to run for House in the districts encompassing or surrounding Allegheny County. Boerio said she wanted to run to meet all constituents’ needs. And unlike Houlahan, Boerio isn’t counting on how her gender sets her apart. Inclusion is Boerio’s message, but it’s not a word that the region is personifying in this year's congressional primaries. One woman or fewer is running in each of Districts 13 through 18 in south-central and southwestern Pennsylvania. That's a far cry from District 5 in the southeast, where eight women candidates filed, the most in any single district. Sweet-Cushman said she believes that the Pittsburgh metropolitan area is falling behind. “Historically, women have been better represented out of Philadelphia,” she explained, because current female candidates in southeastern districts are further along that pipeline between local and national politics than their southwestern counterparts. Many of those women have already served as state representatives. The future of women candidates means getting "a seat at the table." Nevertheless, Sweet-Cushman is hopeful that women candidates in Pennsylvania—and across the United States—can sustain this momentum. The current election cycle is critical to bringing more women into the political fold, Schwartz said. “Having women at the table—in those rooms where decisions are made—matters to this country, from national security to education to health care," she said. "It makes a difference." 90.5 WESA's Chris Potter contributed to this story. UPDATED: 4:33 p.m. on Thursday, April 12, 2018 to reflect incumbent Ryan Costello's withdrawal from the District 6 Republican primary race. Why Does Pennsylvania Elect So Few Women To Political Office? In 1916, Montana’s Jeannette Rankin became the first woman to serve in the U.S. House of Representatives. A century later, Democratic presidential candidate Hillary Clinton is the first female candidate to lead a major party’s ticket. And with two weeks left until Election day, she’s leading in the polls. At 5:30 in the morning of November 9, 2016, Natasha Taylor-Smith crept into her 13-year-old daughter's bedroom. She picked up her daughter's smartphone, typed "CNN.com" into the browser and saw a large picture of now-President Donald Trump. Taylor-Smith put down the phone and woke her daughter up. "As soon as she opened her eyes, she says, 'Did Hillary win?' and I said, 'No,'" Taylor-Smith recalled. Her daughter gave her a confused look. "'Donald Trump's going to be our president?" she asked. 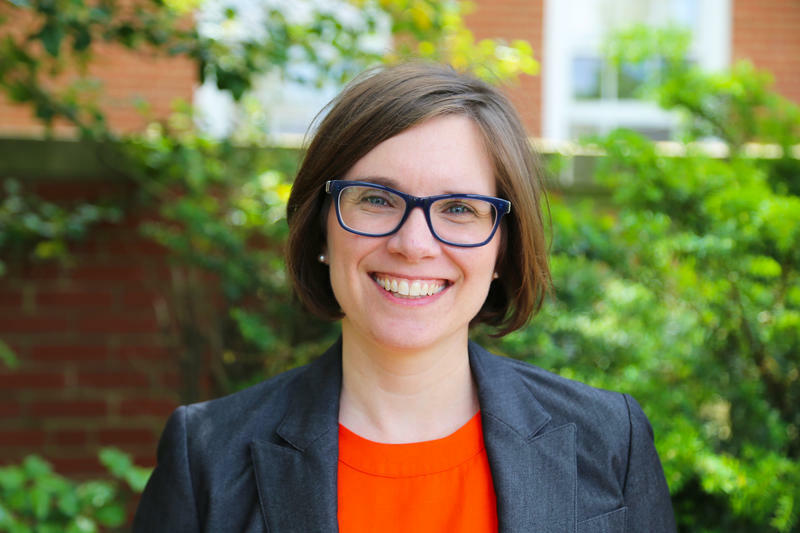 Tuesday is the deadline for early registration to attend Ready to Run campaign training held by Chatham University's Center for Women and Politics.